Hyundai India is the official partner for the ICC Champions Trophy 2013, which explains its hyperactivity across media during the series. I have seen the OOH Fan Park zone created in shopping malls, which was quite neat and crowded! In addition to using the ever popular cricketing platform in India to launch their new spooky commercial for i20 , Hyundai has also introduced a new credo ‘Blue by Heart’ for its cricket themed campaign, which is reminiscent of Pepsi and Nike promotions from past years. 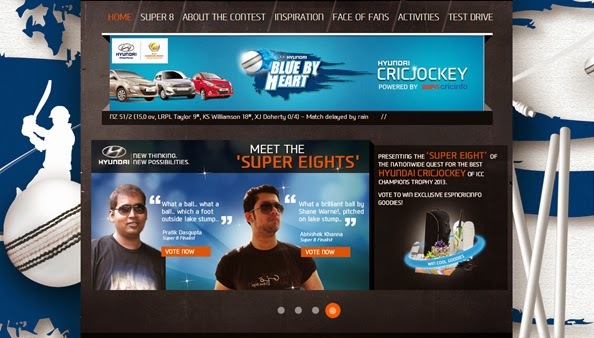 The Hyundai Blue By Heart microsite hosts a CricJockey contest in partnership with ESPN Cricinfo. The first round is already through, where participants were asked to submit their cricket commentaries in copy and audio formats. 8 winners have been shortlisted for Round 2 and they face-off through various rounds of introduction videos, match reportage and Google+ Hangouts hosted by ESPN Cricinfo. 3 Final winners will be decided via audience voting and ESPN Cricinfo’s editorial team. The Super 8 page on the site shares all the entries with write-ups, podcasts and videos. The site also hosts Google+ Hangout videos with post match updates. The landing page brings together social media posts and latest ICC Champions Trophy news from ESPN Cricinfo. The concept is great, well thought through and smartly leverages multiple platforms but the microsite creative execution leaves a lot to be desired. Hyundai India should now seriously start thinking about animation and UI! Most of their web executions are static and uninspiring. More often than not, they are let down by their creatives. Even the Blue by Heart theme video is underwhelming. Also, especially for the team that manages Facebook posts for Hyundai India, here’s introducing url shorteners. Maybe the Hyundai India team needs to take some inspiration from their worldwide counterparts!